Happy Monday!! !First of all, I want to give a BIG HUGE CONGRATS to Katie, the lovely diva who hosts this marvelous party, and her beautiful baby boy, Rocco. What a wonderful gift to be given! I wish the whole family the best! 😀 This past weekend has been a marvelous one! !With one exception… Heat. Wave. uuuuggghhhhh. 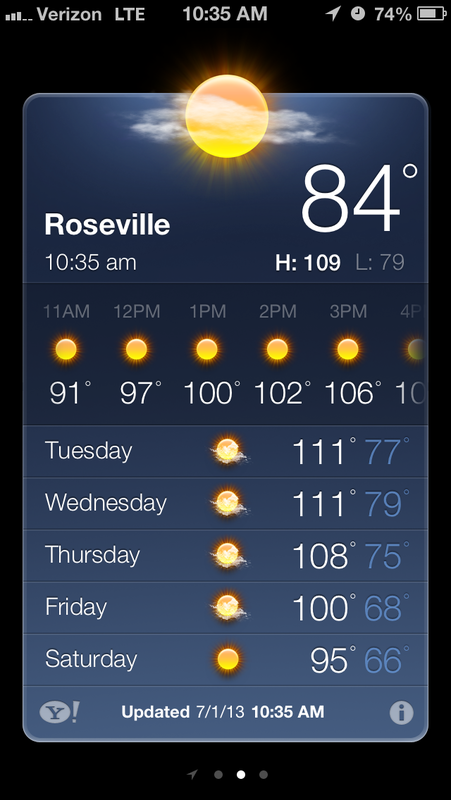 It was all weird, cold and rainy exactly one week ago, and by Wednesday the temperatures were scorching again! This is day 4 of 105+ heat, and its funny because we can’t wait for 9pm, when it reaches a nice, cool 90 haha! 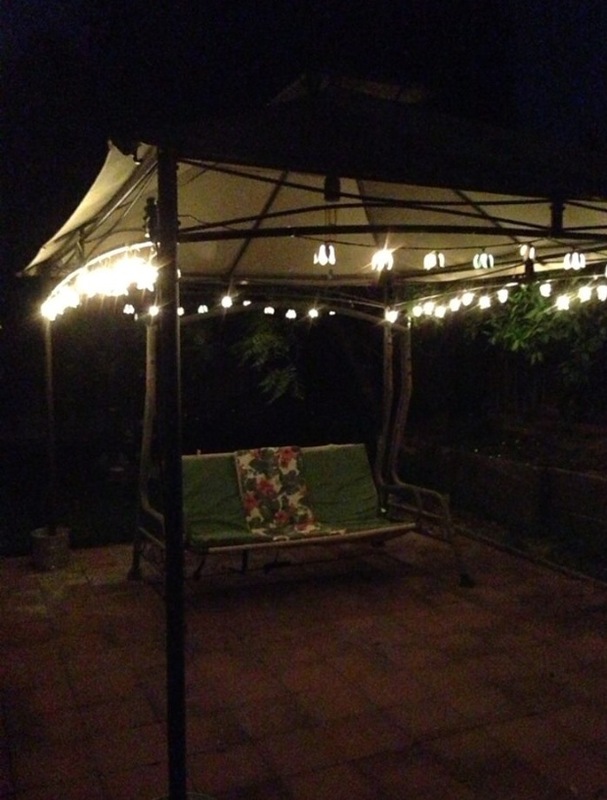 Of course, warm evenings are made all the more enjoyable when outside, and we finally got lights up on our gazebo!! Its so nice to just relax and stare at the lights like a moth enjoy the pretty lights!! 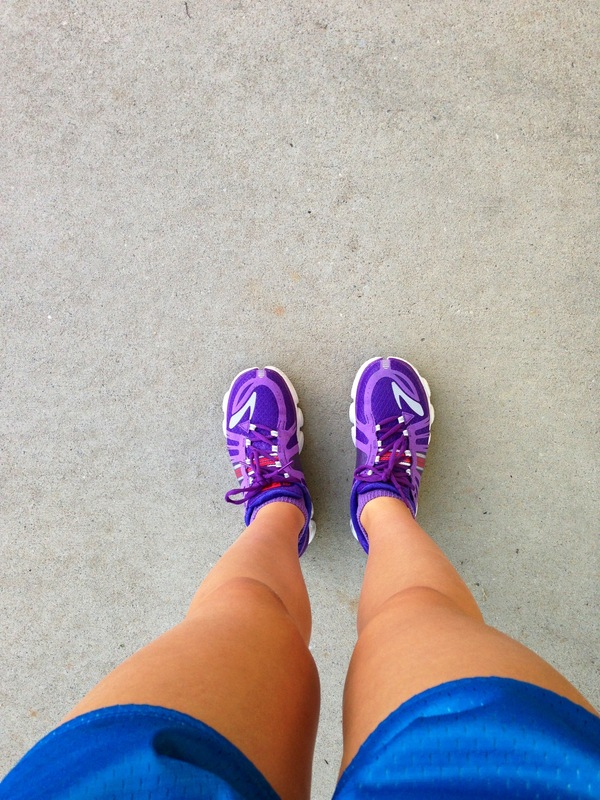 Luckily it doesn’t start heating up until about 9 am, so its finally gotten me back in the habit of early morning runs! Wake up, grab a nut butter stuffed date and off I go! There is no better time to run than first thing in the morning, the air is still (relatively) crisp, scented with dew and sprinklers, and the only sounds are the birds singing, and your feet hitting the pavement in tune with the earth’s heartbeat (like that? Can I be a poet like you now TGITO?? 😉 ) Basically. Otherwise its too hot. And when I come back from the early morning runs, I have time (and motivation) to make fancier breakfasts!! 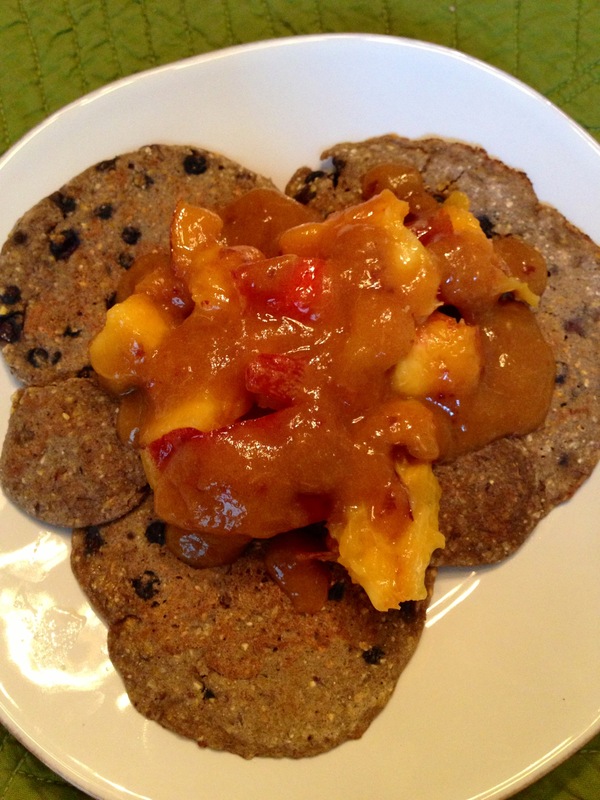 This morning I made my mom and I blueberry cornmeal pancakes topped with fresh farmers market peaches! 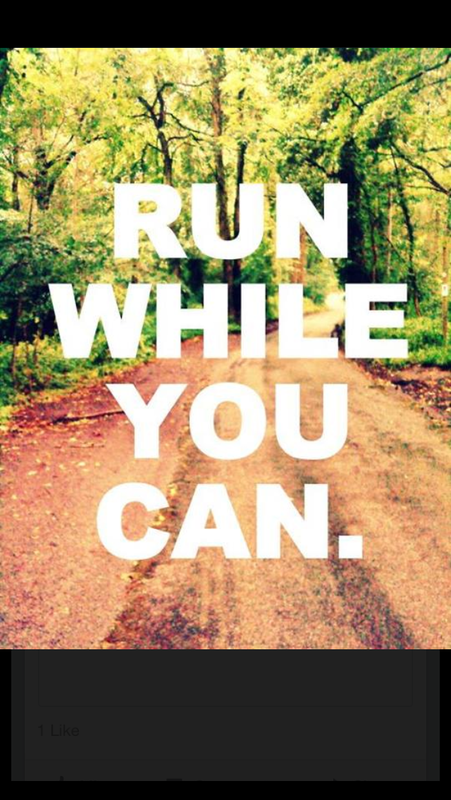 So good!Speaking of running, didn’t I ever tell you guys??? 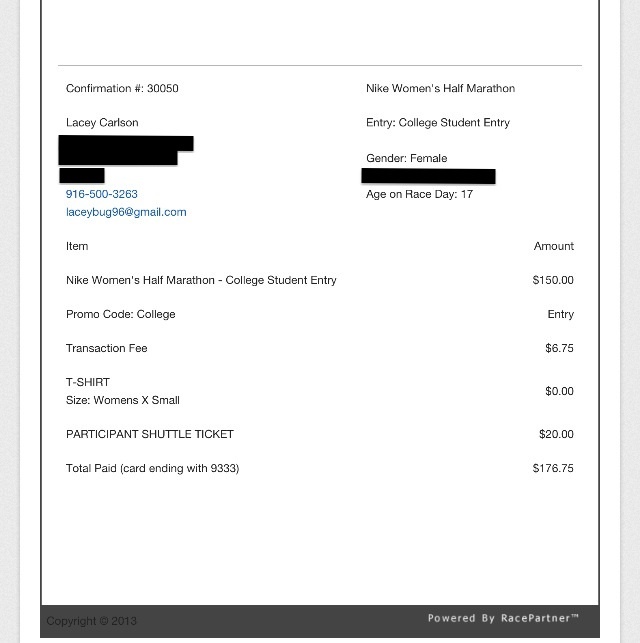 I am officially signed up to run my first ever Half Marathon this October!! Whoo!! I’m sooo excited!! I’ve been wanting to run a half before I graduate basically since I discovered I actually liked running freshman year, and its finally happening! This is such a great testimonial to myself too, that I am finally in a place where I can run and be stronger, not weaker, from it. Its a symbol of the test I’ve had in high school, and that I can conquer anything I put my mind to. I am stronger than I gave myself credit for for so long, and I can tackle mountains (well, hills, but San Fransisco is crazy hilly so if you add them up, its a mountain. kapeesh?) Also Marvelous are Starbucks dates….with myself. But hey, if it motivates me to do my summer reading (I’d so much rather read books of my own choosing…). I heard from Amanda that if you order Starbucks cappuccinos dry, you get them perfectly foamy (my favorite part). She was right! Soy cappuccino, decaf and dry-I drank the coffee part and then added a dash of cinnamon to my cup of foam. 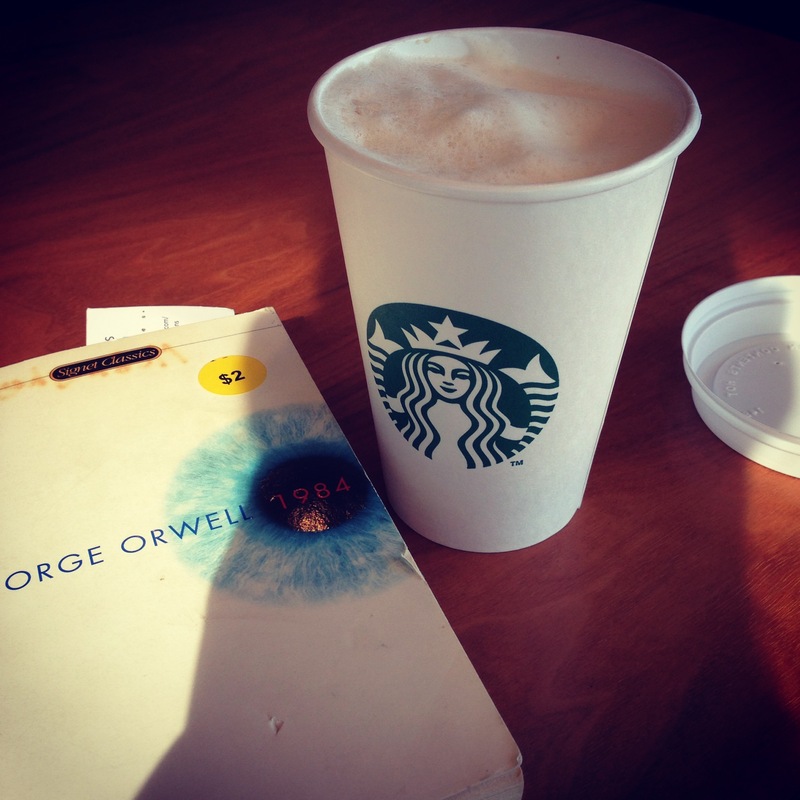 Lets just say that I was that weirdo in the corner reading and eating foam with a coffee stirrer. #foamobsession #sorrynotsorry 😉 Marvelous still are farmers market hauls -especially at the end of the day so everything is even cheaper! We got that gigantic bag of peaches for only $2, and they are super ripe-almost jam like. I have to cook with them before they go bad!! We also found a beautiful head of crisp romaine, chinese spinach (its so pretty! Purple and green! ), a pomegranate balsamic grill sauce, and fresh, handmade vegan ravioli! I’ve never had fresh pasta so I’m excited. 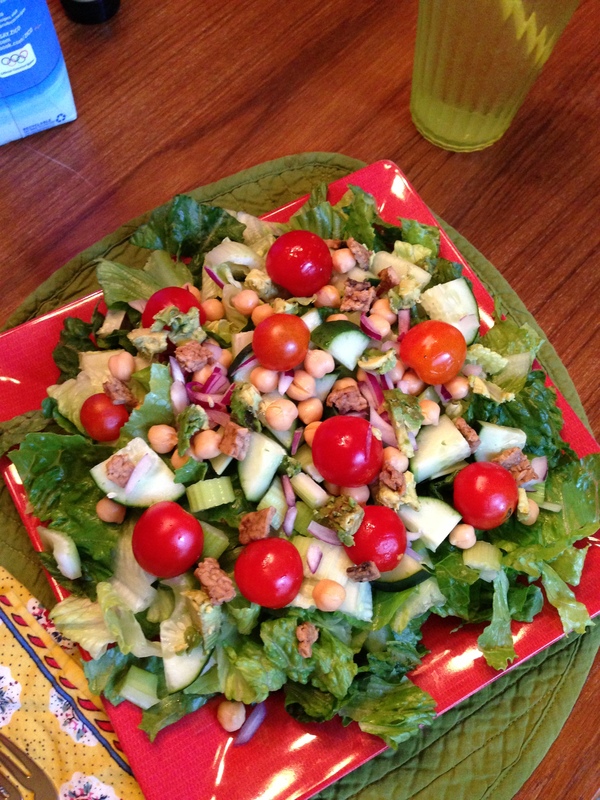 A marvelous, refreshing, and simple salad for dinner (squash on the side) of Farmers Market romaine and tomatoes, plus cucumber, celery, red onion, avocado, tempeh, chickpeas, and a honey mustard dressing and lemon pepper (post photo). 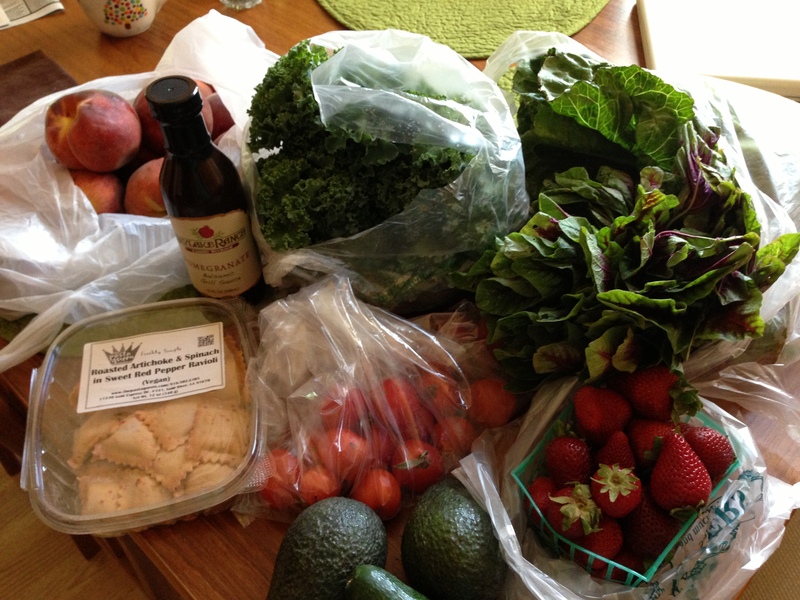 I’ve never had a crisper salad than one fresh from the farmers market that morning! And perhaps most marvelous of all? Its girls week! My stepdad is with his dad and cousin in Washington state this week, visiting museums and baseball parks, so my mom and I have had the house to ourself. Its officially Chocolate and Chickflicks week around here! 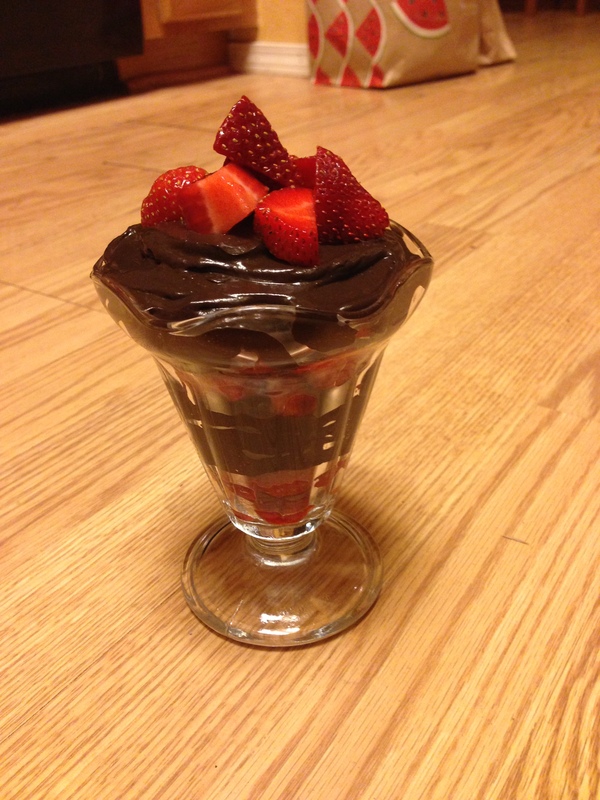 Perfect for my newfound obsession with chocolate avocado mousse and Friends reruns. So with cool morning runs filled with deep thoughts, farmers market runs, and daily chocolate, life could not get any marvelous-er 😉Have you been caught in a heatwave this week?Whats your marvelous today?